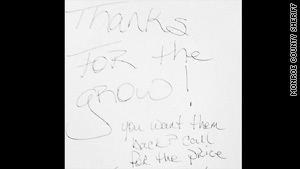 Police left this anonymous note for an alleged marijuana grower who called back to reclaim his plants. Police left note saying: "Thanks for the grow!" "You want them back? Call for the price"
Marathon, Florida (CNN) -- It's usually the bad guys who leave ransom notes, but in the Florida Keys, it was the cops who tried it -- and it helped them bag a suspected marijuana grower. Police say a man called a phone number -- left anonymously by police after they confiscated some marijuana plants -- in hopes of getting the plants back. Instead, the man got arrested. Monroe County sheriff's department special investigations detectives said they seized six large marijuana plants from a vacant, wooded lot, in Marathon, Florida, after they were tipped off by a citizen. Detectives left behind their own version of a ransom note, hoping to get a response. "Thanks for the grow!" read the note, which included a phone number. "You want them back ? Call for the price ... let's talk." Col. Rick Ramsay of the sheriff's office said detectives "were laughing to see if somebody was dumb enough to call back." About 20 minutes after the note was left, the phone rang, and a man asked what he would have to do to get the plants back, police said. "They were shocked this guy called. They negotiated back and forth over a price, and finally settled at $200," said Ramsay. Detectives met the man on a nearby street corner, and he allegedly paid $200 without knowing who he was paying. Police said a 48-year-old man was arrested on charges of cultivating and selling marijuana as well as possession of drug paraphernalia. Ramsay said officers confiscated a ledger book that contained detailed information on the growing operation including "when he planted, fertilized, watered, and harvested." "He even named the plants. One was TNT, and another was Diesel," Ramsay said.